Cortes Family = Proud Cardinals! This past weekend, Joel Cortes (Jovany's father) completed the Miami Half Ironman. The half Ironman is a 1.2 mile swim (in the ocean), 56 mile bike, and 13.1 mile run. Congrats to cross country runner Katherine Dao on being recognized as a scholar athlete! Belle Chasse High Students attend LSU Health Science Center’s School of Medicine Summer Science Research Program. A Belle Chasse High School student is making a difference through his organization, Henry's Foundation. The first cause the newly launched project is taking on is breast cancer. Mrs. Carlone, as President-elect of the Louisiana Association of Principals, advocated public education agendas to our LA Senators and Representatives at Capitol Hill. Belle Chasse High School is pleased to announce the release of their 2016 School Performance Score of 114.8 and an “A” Rating. Turner Industries recently donated and cooked lunch for our teachers during Teacher Appreciation Week. BCHS student built and painted a bench made in honor of our veterans! Belle Chasse High School Principal, Mrs. Carlone, takes flight on a Blue Angel. BCHS Spanish classes, teachers and parents attended a cultural field trip to Loyola University! Belle Chasse High School is very proud to announce that Oleksandr Molchanov is a National Merit Finalist. Congratulations to the Literary Rally participants on their achievements at the recent rally held at Southeastern University. Good luck at the state rally! Ms. Breland of BCHS reigned as Queen Cleopatra this Mardi Gras season! "It's a dream come true for a teenager, who has known since grammar school, that he wants to run for public office." Boys Cross Country Win State Championship! Congratulations to the boys Cross Country team on winning the 2016 State Championship!! 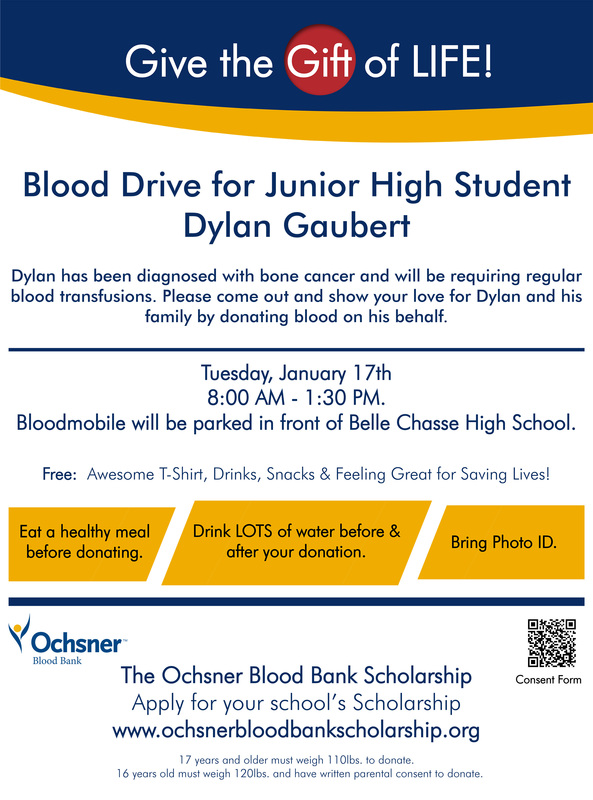 Please come out and show your love for Dylan and his family on January 17th by donating blood on his behalf. Click the link above for more information. This year's award goes to a teacher who pushes her students to the limit, expects nothing but the best and inspires her colleagues. We are very proud to announce our 2017 Teacher of the Year Ms. Marjorie Ambrose! Thank you for all you do! The LHSAA proudly announced the names of the student-athletes selected to the 2016 LHSAA All Academic Cross Country 4.00 Scholar Team and our very own Josh Hewitt made the list! Congrats Josh! Roman Harper of the New Orleans Saints was a substitute teacher for a day at Belle Chasse High School.